What Is the Evidence That What I am Doing Is Working? Surrender your anxiety! Be silent and stop your striving and you will see that I am God. I am the God above all the nations, and I will be exalted throughout the whole earth. Tears slid down my cheeks as I walked hopelessly to the bus stop. Another day of routine coated in restlessness, another recognizably minor event yet heavy and familiar enough to cause anxiety and allow the enemy to usher in doubt and lies that nothing will change bombarded my morning. Feeling defeated left me in sobs and asking God “what is the evidence of what I am doing that it is actually working”. You may be saying the same thing and looking for evidence that your trying to remain faithful in the things and pursuit of God is not in vain because the world and the enemy are trying to convince you of this lie. You may be striving for things and progress to make something happen that God can make happen in less time if you learn to trust and obey Him. You may be looking for evidence that God sees your pain and barrenness in the midst of your faithfulness and much sowing. And in all of this you may have spiritual relapses and doubt and sin may be creeping in. Thank God for His mercy and forgiveness. He wants your undivided heart, not perfection, which is false and aimed for in our own strength. We can do nothing apart from God and God wants us to instead aim for spiritual maturity. But as I walked on, the Holy Spirit patted me on the soul and comforted me to the bus stop. It was at work, tears no longer present, heaviness tucked away, and after my morning greetings with “how was your weekend” that God would answer me. Someone asked me if I was familiar with excel sheets and from there as I proceeded to try and help with her document I realized again that God listens and answers, and even moreso He cares. She informed me that as I stood next to her desk she basically said she felt like she was being led by God to encourage me. Some of the things she said was you are not going to please everybody, God wants you to balance and know who you are. And she also told me that I need to stop beating myself up. I teared up as she expressed what I knew what was God answering me through her. Have you been feeling defeated? Are you having a hard time learning to rest in God? Are you realizing you haven’t been seeing yourself through the eyes of God? Are you beating yourself up and experiencing condemnation? Know that God is listening to your heart, collecting your tears, and wanting to dialogue with you about everything that doesn’t just concerns His heart but your heart also. Know that there is a Comforter that brings you comfort and healing, guidance and hope. Know that the efficacy of the blood of Jesus still works and is efficient to do all what it was shed to do, and that is to save, protect, and deliver you. While receiving this knowledge through the Word of God, proceed to take one day at a time and pray. Catch, check, and change every thought that does not line up with God’s word about you or your life. Hold on to your faith by the Word of God and the love of Christ. Press forward. And learn to be still at the same time. He says, “be still and know that He is God.” Psalm 46:10 That means recognize who our holy, faithful and sovereign God is. And that means to stop striving and trying to run the universe; you are not qualified to do so mentally, physically, spiritually, emotionally, etc. It doesn’t mean to be passive or unproductive, but it does mean to learn to depend on God. Moreover, that also means learn to rest in Him for He will be your power, love, and a sound mind in the midst of busyness, trouble, chaos, distractions, feelings of emerging hopelessnes. Seasons come and go but God is the same yesterday, today, and tomorrow. And He is good and faithful, periodtt. What question(s) are you asking God today? Have quiet time with God and ask Him. And expect an answer. The stranger asked me about what I was singing. “I was praising God,” I said. “You love God?” the stranger asked. Are You Being Consumed By The World Around You? He replied that he too loved God and used to read the bible, but that he didn’t have time anymore to read the Bible. He basically said he didn’t have time anymore to read the Word because the world had consumed him. In fact, it did look like he was being consumed, but there are many of us being consumed and by different things. I remembered that God warned me not to let the world around me consume me. Are you being consumed by the world around you? For some it may be drugs. Some it may be seemingly less harmful than that but still hindering our quality of life and relationships. For me it is distractions and busyness. What is consuming you? Moreover, I told him that the reason he gave for not reading God’s Word and this particular time [we are living in] is all the more reason to press in to reading the Word of God. I also shared that he should still read it no matter if he feels like he didn’t deserve God [God’s love] or not. The fact is Jesus died for us all and He loves us unconditionally. We all have fallen short this week, and last week, and the week before last. Trying to get the help my mom needs after being injured had left both of us, mom and me, frustrated and me short of patience. I know I failed quite a few tests this week with two C’s (cussing and complaining). Maybe you too have regrets about how you handled some things this week? Maybe you had a much more difficult test to pass? Maybe you have been feeling unloved or unworthy for awhile because of life circumstances, others, or childhood incidents? And our enemy, the devil, sometimes sends these circumstances and experiences as attacks on our self esteem and souls to hinder us from seeing ourselves the way God does and from moving in our purpose. After all, how can you fulfill what God has called you to do if you do not walk in His authority and identity? Maybe a lot has been going on with your family, like with my family? You have been pressing in prayer and reading God’s word but feel flabbergasted as to why things are not going right and one bad thing after the other is happening to you all. Maybe your dreams are not coming to fruition? Maybe you had to let that dream die to surrender it all to Him and have been getting tired of waiting. Yet, you are watching everyone enjoy their successes. Maybe you are in over your head in debt and are worried you will not be able to pay your bills and debts? Be encouraged though and do not feel defeated. In life there will be trials and tribulations. But God! Maybe you have been sick and expecting God to restore your health? Maybe you are struggling to let go of a sin, a habit, or a relationship, etc. and are in desperate need of God’s grace and deliverance? Maybe you are experiencing depression, stress or overwhelming fear but you know God did not give you a spirit of fear, but of power, love, and a sound mind. Maybe your marriage or children are in trouble? You have been praying for help to endure and for you to surrender them in God’s hands but still no change. Do not feel defeated. Trust God. Maybe you are young and have had an awful start in life? Maybe they said you will never be anything? But you know deep down there is more to you and your life than they can see, even you can see? Don’t let the devil make you feel defeated, unloved or even a lost cause. That is his portion, not yours. Pray some more. Pray in faith and pray God’s Word and strategies. Believe that He can and let no circumstances move you to the realm of doubt. Take every thought captive and make it obedient to Christ Jesus. Fight and fight the good fight of faith. Release every area of your life to the Lord and get God’s perspective, value, and instructions in every area. Go after the Lord and allow Him to feel your heart with substance of things hoped for and the evidence of things unseen. God’s children are not defeated. Jesus won the war for us, and every battle within the war is already provided for and Jesus will also win those. Step out of the way, trust God, and remember You are already on the winning team! We are now new creations in Christ, those who believe and have received the salvation of our Lord & Savior, Jesus Christ. When the devil tries to bring up our past and forecast our future, let us remind him that he has already been defeated and he has no other chance, destination, or opportunity but down. He wants you to feel defeated and take on the position of a defeated being. But you can not believe his lies or try on his deception. The feat of the defeated is surrender, surrendering every area of our lives to God. It is also responding to as well as accepting the unfailing and unconditional love of God. 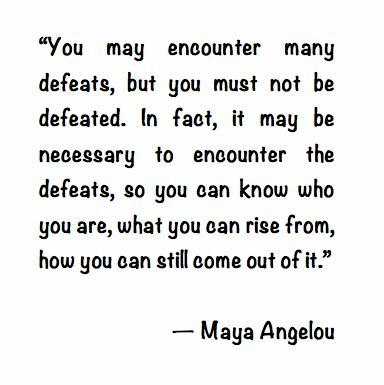 Be of good cheer and remember that you are not defeated. Even during the storms and rustling winds can you survive with Jesus by your side, the engulfing of His presence, and within the perimeters of His grace.